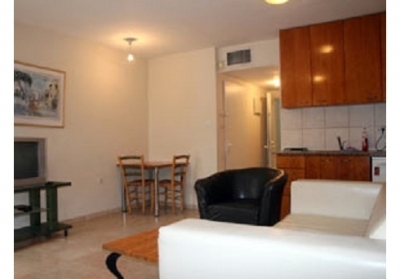 Dizengoff Beach Apartments is located in the finest area of Tel Aviv, and only a two minute walk to Israel's famous Tel Aviv beaches. This is a brand new building, which is fully furnished to the highest level and includes everything you will need to make your stay an unforgettable experience. Each apartment includes one bedroom and a well designed, modern living room, with a fully furnished kitchenette. Includes internet access, cable TV, towels & linens and weekly cleaning. Prices are per night, for 1 person, $10 charge for second person, and $20 charge for each additional. On Dizengoff street near the port 'NAMAL' of Tel Aviv where everything is happening! Stretched along the beautiful beach strip of the Mediterranean, Tel-Aviv is Israel's largest city and biggest commercial center. It is a busy metropolis, which inspires its visitors with a unique energetic atmosphere of excitement and fun. Visible from a distance with its seafront skyscrapers and exclusive hotels, Tel-Aviv presents a lively combination of entertainment venues, shopping malls, exotic markets, non-stop active nightlife, gorgeous golden beaches and wonderful restaurants of all kinds. It is also the country's greatest cultural center, a home for a variety of museums, galleries, theatres and concert halls. Dozens of restaurants, clubs and entertainment places have opened along the renewed promenade and during the summer months, thousands of people stroll along its length, many of them until the small hours of the morning.